UnifiedCommunications.com, a provider of industry-leading unified communications solutions, has introduced their new Device-as-a-Service solution. This market-ready solution enables UC Cloud Service providers to bundle headsets with their Unified Communications as a Service subscriptions. UnifiedCommunications.com has introduced their new Device as a Service (DaaS) solution, as an innovative approach to managing devices for leading UC platforms like Microsoft’s Skype for Business. Available initially to customers with 100–2500 users over a 12, 24 or 36-month service duration, this subscription service provides customers with an OPEX solution to access both cloud-based unified communications services and the audio devices that users need to properly utilize the service. Ryan Herbst, VP of Device Strategy at UnifiedCommunications.com, says that the new approach will benefit agile businesses who have embraced UC and appreciate the advantages of an operational cost model with a comprehensive service-level agreement. In partnership with Plantronics, a global leader in audio communications, UnifiedCommunications.com will roll out the new solution with bundles including Plantronics Voyager, Savi, and Blackwire Bluetooth, wireless and wired headsets. This new approach demonstrates UnifiedCommunications.com’s commitment to implementing comprehensive unified communications solutions that serve their customers’ changing needs. With more unified communications users transitioning to cloud-based infrastructures, Unified Communications as a Service is enjoying significant market growth. 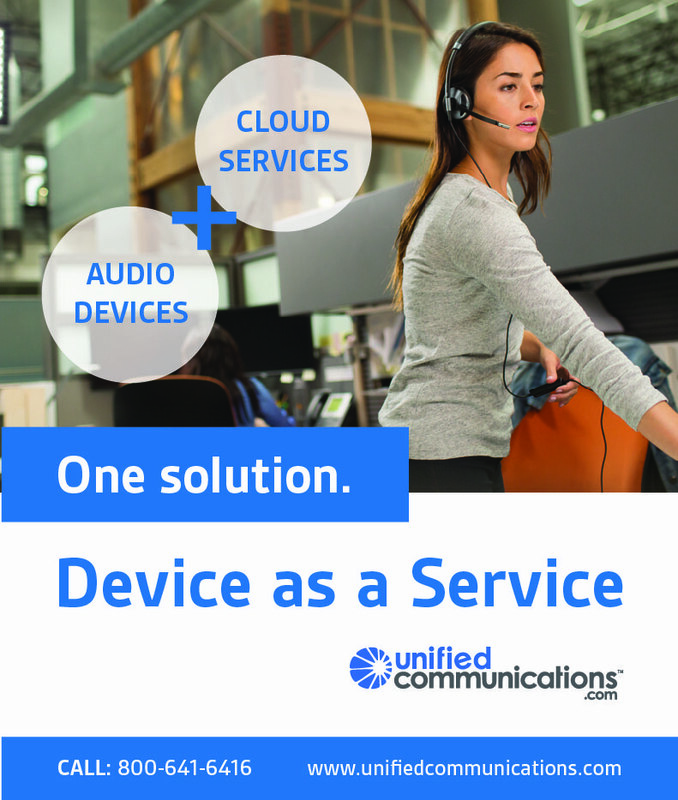 Visit http://www.unifiedcommunications.com/t-Device_as_a_Service.aspx to explore the full range of devices and services on offer and learn how a DaaS solution could serve your organization. For more information, please visit unifiedcommunications.com or call (800)641-6416. Plantronics is a global leader in audio communications for businesses and consumers. They have pioneered new trends in audio technology, creating innovative products that allow people to simply communicate. From unified communication to Bluetooth® headsets to gaming solutions, they deliver uncompromising quality, an ideal experience, and extraordinary service. Plantronics is used by every company in the Fortune 100™, as well as 911 dispatch, air traffic control and various mission-critical applications for those on the frontline. For more information, please visit plantronics.com or call (800) 544-4660. Blackwire, Plantronics, Savi and Voyager are trademarks of Plantronics, Inc. registered in the US and other countries, and Plantronics Device-as-a-Service Pro is a trademark of Plantronics, Inc. The Bluetooth trademark is owned by Bluetooth SIG, Inc. and any use of the mark by Plantronics, Inc. is under license. All other trademarks are property of their respective owners.